The Maurice Futura is very attractive to passengers and uses only the minimum of petrol. It is reliable and has a good capacity and average speed, making it a very well rounded vehicle for all types of routes. The Maurice factory has developed a special hull to make the vehicle light to provide low petrol consumption and speed, but still kept the structure sturdy. Special ticket reading devices instantly read the passengers travel cards as they pass through the doors. City T13 is a modern tram with lots of good qualities. The capacity and high average speed make it a good option for all tram routes with lots of passengers. It's also a very attractive tram, helping to keep passengers happy. Railcad Volatio is quite expensive, but has an excellent passenger capacity combined with a good average speed. 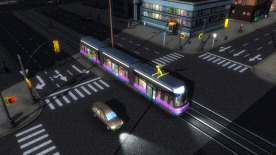 The Railcad factories have a special technique to make their trams durable and use only top quality parts to make sure the need for maintenance is low. The Volatio features a 5-unit structure that quarantees a large capacity while making the vehicle highly maneuverable and fast. With its streamlined form Donau Caravel is the superior ferry boat. The sleek and modern Austrian design of the exterior is complemented by the comfortable and stylish interior. Its attractiveness to passengers and high average speed are countered by its high rate of energy consumption. Still, it is widely used for both public transportation and tourist services. When looking for a good tram for inner city routes, ZiA-11E should not be overlooked. It's a classic model well suited for city routes with stops within a short distance from each other.